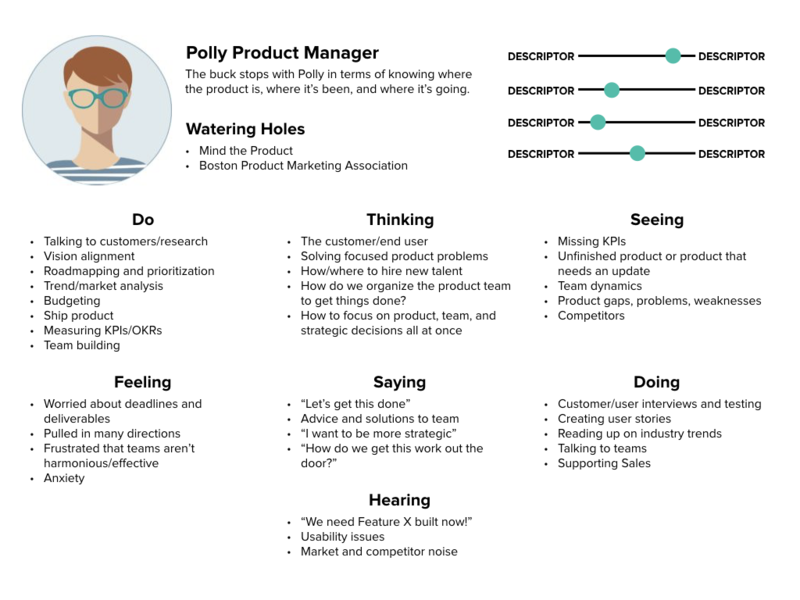 Experience mapping is one of the most effective ways to highlight user insights and improvement opportunities within just about any kind of product or service. Increasingly, people are choosing products and services based not on their features or functions, but rather on the experiences they deliver. But how do you design an experience that is sure to delight? How do you build a product or a service that people will want to use? Before you start designing—let alone actually building—it’s important to look at the whole picture. It’s critical that you understand how your users will interact with your product (or, if you’ve already built it, how they are interacting with it) to ensure it’s delivering the intended value. Your entire product team must be on the same page with respect to the user’s needs, the product vision, and the path you will take the get there. In product design circles, this is often accomplished by creating a visualization called an experience map. 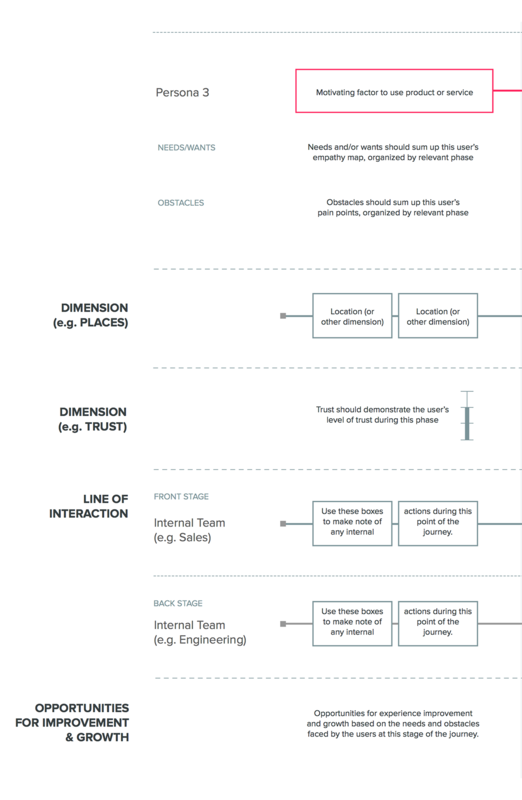 Experience maps are a critical part of the strategy and design process. They involve capturing, communicating, and visually displaying how users interact with a product, service, or website over time. It’s a (practically) foolproof way to illustrate all the different touchpoints—a user’s contact with your product/service—that a user interacts within any given experience. Experience maps identify and highlight your users’ needs, expectations, wants, and the potential path(s) they take to reach a particular goal or solve a problem. We use experience maps to understand how everything fits together and to pull out the most important pain points and opportunities. The process of creating an experience map is as important as the final artifact. It creates a shared understanding across your diverse team of stakeholders. The process of creation and ideation that happens throughout the experience mapping process uncovers key opportunities and pain points that can help define your roadmap and will ultimately lead to designing a better customer experience. At Fresh Tilled Soil, we create a lot of experience maps as part of our design projects. Recently, two of our designers worked together to create a template to streamline the experience map creation process. Following is a list of seven keys to creating an experience map more efficiently. First, no experience map is complete unless it demonstrates user motivation. When illustrating the phases, remember that the pre-experience is just as important as the post-experience (in fact, it’s all part of the WHOLE experience). Secondly, it will take your entire product team to deliver on the customer experience that you design, so it’s best to involve them in the experience mapping process from the beginning. Experience maps typically run on a timeline, whether that is over one hour or an entire year. Break up the timing into subphases of the experience to frame the user journey. Plot user journeys onto a phased timeline to highlight how users change and interact with your product or service over time. Remember, this should represent your users’ goal-oriented journey and not your product or business process/steps. For example, the phases could be Motivation/Pre-Sale, Sales Cycle, Implementation, Launch, and Account Management/Maintenance. Or the phases could represent a simple online purchase process that includes Product Search, Product Comparison, Shopping Cart, and Checkout. This approach allows you to specify every touchpoint in a user's experience, while also aligning other dimensions like emotional state, fears and concerns, device needs, etc. You should always tell the story through the lens of your users. In fact, experience mapping is most useful after you’ve already done some user interviews and consolidated that information into personas. Personas are a great way to understand your target audience. 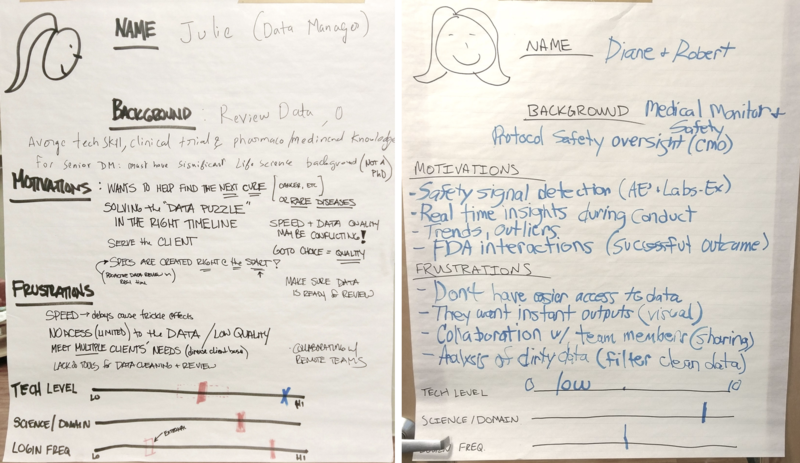 Personas are made up, but they are not entirely fictional: They are based on data and information that you’ve (hopefully) gathered from researching and interviewing actual users. Personas incorporate user goals, needs, and interests and embody the voice of the customer. As such, they help us evaluate and understand what our users need. They are valuable because without a thorough understanding of our users’ perspectives, we’re just grappling around in the dark, designing for fictional scenarios born of our own biased imaginations. In order to gain insights from your experience map, you should include data on each persona’s thoughts, feelings, words, actions, needs, and wants. Depending on your project, you could use direct quotes, or you could filter it all into summaries for each phase. Don’t forget to create a special section for obstacles (pain points) that are impeding or frustrating the user. These are normally concluded from the empathy data and will help to inform opportunities for improvement later on. It may be important to make note of which channels your users are interacting with at each step of their experience. Channels could include things like desktop, mobile app, in-store, word of mouth, phone, SMS, or any other relevant locations and methods of interaction. These channels can be depicted using icons or just simple words. 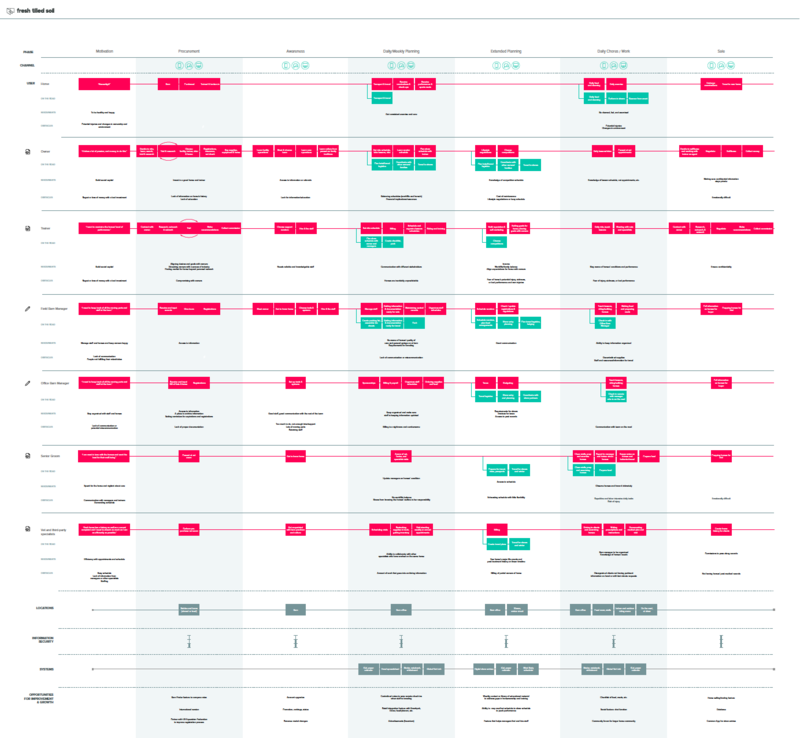 An experience map can have several different dimensions on one timeline—the most vital of those being the user journey and opportunities for improvement, with room in between for anything else that is deemed important to the experience. In many experience maps, you will often feel the need to go into further detail on another aspect of the experience if it’s a large part of the story. This could be anything from location, to trust level, to line of interaction. Many maps include a line of interaction based off of the service mapping model, to demonstrate both front-stage (customer-facing) and back-stage (behind-the-scenes) employee actions, and how they relate to the customer experience. This is by far the most important part of the experience map—without it, the project cannot move forward. These opportunities are insights informed by each persona’s empathy data and the obstacles they experience throughout each phase. The following is an example of detailed experience map for a software company that helps equine barn managers improve communication, information sharing, and scheduling across the myriad of roles involved in the care of horses. Fresh Tilled Soil took the product team through an experience mapping process to highlight the important user touchpoints. Experience mapping can lead to a new or improved product, or it can lead your team to focus on an important but previously unrecognized problem that is uncovered during the process. You can even create more detailed experience maps highlighting one piece of a larger experience. 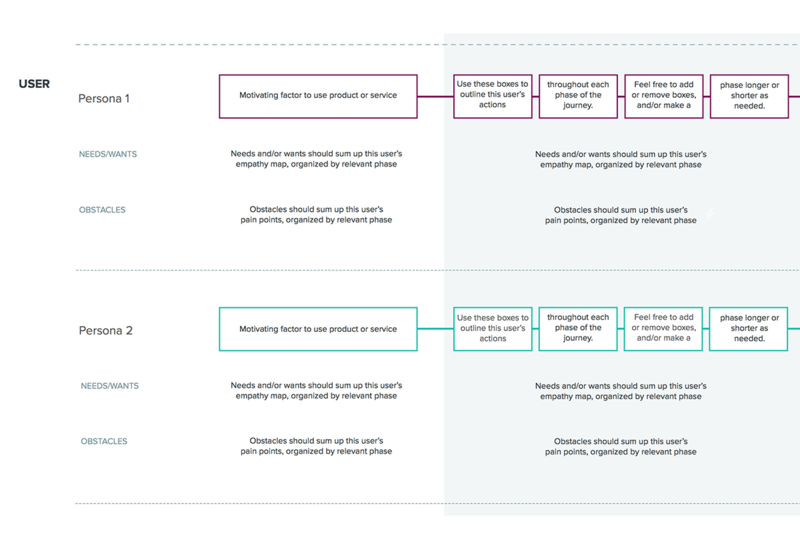 Whatever the outcome, the process of experience mapping will undoubtedly help you along the path to creating a better experience for your users. Heath is the Vice President of New Relationships at Fresh Tilled Soil. He writes about product, marketing, and design—when he's not coaching, cooking, or riding bikes.